The 2014 Mobility Assessment Report (MAR) was presented to the Planning Board on April 17. The presentation can be seen here. Montgomery County's traffic congestion has been stabilizing over the past two reporting periods from 2009-2011 and from 2011-2013 according to the 2014 MAR, a biennial study by county transportation planners that monitors local transportation trends. To read the report, click here." 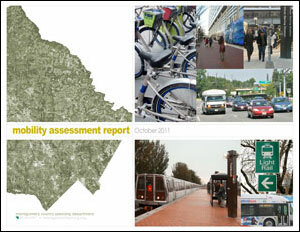 Find out the latest about the Planning Department’s Mobility Assessment Report. Planners Eric Graye and Jose Dory are interviewed about this report which looks at the most congested intersections in the County.